It is clear that the document manipulation system introduced by RBS employee Jane Fraser produces documents which are neither a "copy" nor "true". Is there any right-thinking person in the whole of the United Kingdom who would say that this new RBS practice is acceptable? What does it say about the RBS and about British banking generally that this "creative" system has not only been introduced by the RBS but also officially lauded and congratulated. Would any bank admit to this kind of practice? Would the RBS have been prepared to talk about this openly in the absence of the leaked memo? This is outrageous. I cant believe that the OFT actually appear to condone the position taken by RBS. I wrote to RBS about 18 months back for a copy of the agreement and in their first response they admitted that they couldnt supply a copy and had "discharged" the debt - I didnt even ask them to write it off. I'm in a similar position with HSBC and trying to argue that I'm prepared to pay off the principal but not the interest they have charged over the last 7 years, ie. no agreement = no right to charge interest. They are not accepting and the fight goes on. Interestingly, RBS and HSBC point blank refuse to remove Defaults they have filed against me. All comments are my personal views - if in doubt then seek professional advice. If you think i've helped then please tip my scales. Where's the morality in that?? You may receive different advice to your query as people have different experiences and opinions. Please use your own judgement in deciding whose advice to take. If in doubt seek advice from a qualified insured professional. Any advice I have offered you is done so on an informal basis, without prejudice or liability. Check out the next installment in the Guardian tomorrow. what is it they say anbout leopards and spots ?? Competition between the Old and New Banks was fierce, and centred on the issue of banknotes. The policy of the Royal Bank was to either drive the Bank of Scotland out of business or to take it over on favourable terms. The Royal Bank built up large holdings of the Bank of Scotland's notes, which it acquired in exchange for its own notes, and then suddenly presented them to the Bank of Scotland for payment. To pay for these notes the Bank of Scotland was forced to call in its loans and, in March 1728, to suspend payments. The suspension relieved the immediate pressure on the Bank of Scotland at the cost of substantial damage to its reputation, and gave the Royal Bank a clear space to expand its own business, although the Royal Bank's increased note issue also made it more vulnerable to the same tactics. Despite talk of a merger with the Bank of Scotland, the Royal Bank did not possess the wherewithal to complete the deal. By September 1728 the Bank of Scotland was able to start redeeming its notes again, with interest, and in March 1729 it restarted lending. To prevent similar attacks in the future, the Bank of Scotland put an "option clause" on its notes, giving it the right to make the notes interest-bearing while delaying payment for six months; the Royal Bank followed suit. Both banks eventually decided that the policy they had followed was mutually self-destructive and a truce was arranged, but it still took until 1751 before the two banks agreed to accept each other's notes"
Does anyone have a copy of that internal memo by any chance? I am in the middle of this very problem. If you pm me your email i'll forward you a copy. So if a person does it, it's 'fraud', but if a bank does it it's 'thinking under pressure'. I think this might have happened to me. My original debt was £13,000. I have been repaying £150.00 per month for 5 years. My debt is still £13,000. I'm about to stop paying as this could go on forever. Any advice would be welcome. I would take JonCris's advice ...BUT CONTACT YOUR MP immediately and tell him to have a word with Mr John Healey MP (Paul W's MP) & Andrew MIller MP ( my MP) who are completely aware of what RBS are doing...it looks as if you are another victim of RBS's " Router Accounting" system which is under investigation by those MP's and ....also The Sunday Times, contact Paul Walton by PM and give him your e-mail address and I would imagine you will be contacted by the Sunday Times journalists. Thanks for the advice everyone. It's such a relief that someone appears to be listening at last. I will contact my MP but I am ready to fight and I have plenty of documentary evidence to support my case. I have stopped my standing order but could someone tell me what a "charge" is and how it will affect me. I do not own any property and I am not married although I am living with my partner. Incidentally, I have asked the bank ,on three occasions over the years, to send me details of the charges and interest they have added to both accounts. The letters were sent by recorded delivery and with a postal order for the required account (I'm not allowed a chequebook because of this debt). RBS sent me records for the overdraft but not the loan account on the third time of asking. Thanks Paul. I think this is going to be useful. Has anybody used this memo as ammunition with RBS? I have a Mint card (was RBS Adavanta) from 1997 and the application form they sent me was not countersigned by RBS and I am thereofre going to write the standard letter back )also no 'overleaf' conditions as referred to in the declaration part. 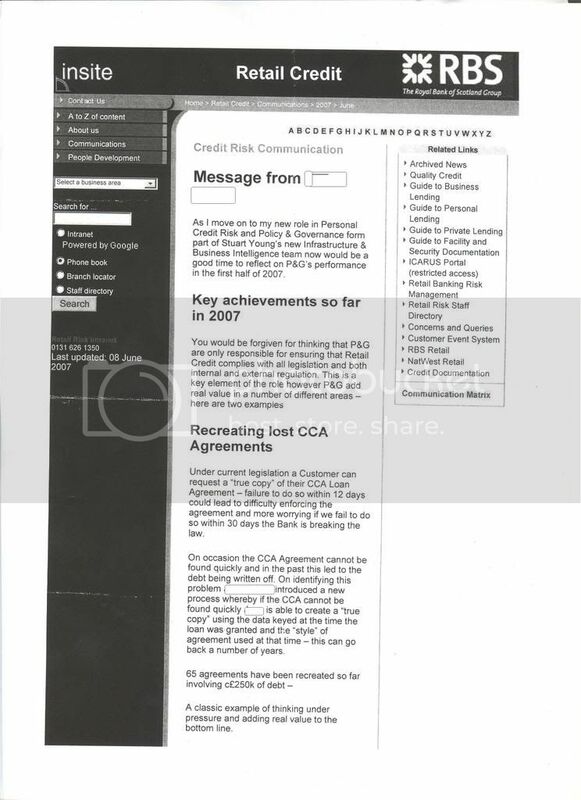 Also have an RBS card which I sent the CCA letter on 9th March - no reply at all so far. Should I wait 30 days until they are breaking the law, or should I write now? Also me & my husband both have Tesco Credit Cards (also RBS) and they look OK on the face of it except my husband's application has our old address pre-printed on it, so no mention of our address at the time of taking the card (March 2000). Also, no 'overleaf' details as above. My Tesco card looks moew watertight on the face of it, but has no overleaf terms either. All 3 of them sent me copy terms & condition leaflets from original tiem and current, so they are obviously trying to cover all bases now. I have this morning sent off for my original loan agreement ( CCA), albeit I phoned them on the 23rd March for "true" copy, and advised me this takes 30 days (confused as to the 12+2 day rule), anyway as I was advised to put everything in writing, I have done so. This may sound like a silly question, but how does one know whether this is a true copy, (obviously signtaures can be copy and pasted). First off all, are you fortunate enough to have a copy of your agreement for when you first signed your life away? This can obviously be compared with what RBS come back with. Unfortunately, there's no (known) way of proving otherwise without the original document. I for one am convinced my 'agreement' is, shall way say, ;tampered with a little', but proving it is another issue entirely. 25k is substantially bigger than my debt to RBS - you need to be careful they don't go for a charging order against your home (if you have a mortgage). Also, find a spare tenner and send off for a complete SAR. I have contacts within RBS and do understand where this is coming from. The main issue is right there in the RBS memo helpfully provided by paulwlton (dating back to 2007). The bank uses the notion of a true copy to cover the fiscal points of the loan - interest rate, fee, term and monthly costs. Because the format of loans has changed through evolving legislation these details are permitted to be recreated based on the salient details of the original. What cannot legally be recreated is the customer's signature on the loan agreement. Bank records will prove that funds were released to the client's account and whatever payments were made to the loan account will provide evidence of the clients knowledge and tacit agreement that the facility existed. In response to danson79's comment, in what way was his agreement "tampered with a little"? Whilst I'm not supporting any attempt by the bank to appropriate funds by deception, they do need every penny they can get right now and we should expect them to play hardball in these cases. The good news now is that houses are unlikely to be at risk unless the loan is part of a regulated mortgage contract after the changes invoked by the FSA and there can be no doubt as to whether or not these are in force. What cannot be created is a completely different agreement. In other words a reconstructured agreement cannot be conjectured nor can terms & conditions be added that were not there at the time the original contract was entered into. That's pretty much what I was getting at. No bank (or other lending organisation) can unilaterally change a credit agreement after signing, that would seem to be basic contract law. What they can do is recreate the original loan agreement using the terms and conditions in force at the time of signing to produce a replica of the original. It seems sensible to keep your personal copy of the agreement in a safe place until the loan is cleared, which is why the CCA requires all lenders to provide one within 7 days of drawdown. That way there can be no doubt and the banks can't "move the goalposts" after the game has started. That would be totally illegal and morally reprehensible.